Blocked sewer getting you down? We can fix it for good. Here are some typical signs that indicate that you may have blocked sewer. If you act at this stage, you could avoid an emergency. What causes a blocked sewer? 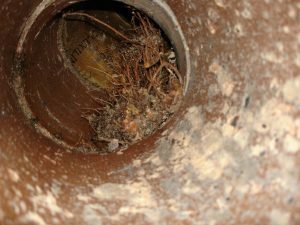 Tree roots are the most common cause of a blocked sewer. If you have camphor laurel or fig trees in your garden, it’s likely you’ve experienced sewer problems. 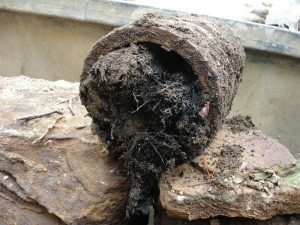 Tree roots aren’t the only cause of a blocked sewer: Often tooth floss, sanitary towels and even household objects can trap sewerage and debris and block drains or toilets. It’s important to act when you suspect that you have a blocked sewer. For example overflowing sewage is a health risk (not to mention unpleasant) and damaged drains that are left un-repaired may cause further damage to your property in the longer term. Householders are currently responsible for the maintenance and repair of their private sewers or lateral drains (e.g. the section which joins your property directly to the Water Board’s main). When it comes to emergency drain clearing, Fluid H2O has all the expertise and equipment you need to get the job done quickly, professionally and with the minimum of fuss. We are available 24 hours a day, 7 days a week to respond to your blocked drain emergency. We understand that it’s an emergency and act fast.